Myxomatosis is a severe viral disease of rabbits that decimated the wild rabbit population when it arrived in Britain 50 years ago. Domestic rabbits are also susceptible to the disease and deaths in pets are reported every year. How can pets catch Myxomatosis? 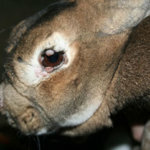 The main route of infection is through fleas and mosquitoes that have previously bitten an infected rabbit. 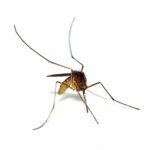 It is also suspected that midges and mites may pass on the disease. Direct contact with infected rabbits can also spread the disease, particularly secretions from their breathing and direct contact. All pet rabbits – indoors or outdoors – are at risk. Rabbits living outside (especially if wild rabbits enter the garden) are at especially high risk. 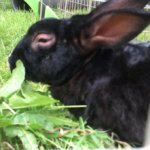 How can I protect my rabbits from Myxomatosis? Vaccinations are the most important of a package of measures you should take to protect your rabbits. Rabbits can be vaccinated from 5 weeks of age. Boosters are needed every year. Myxomatosis Vaccination cannot guarantee absolute protection: vaccinated rabbits do occasionally catch Myxomatosis. However, in vaccinated rabbits, the disease is usually milder, sometimes just a single skin lesion, or a short, fairly minor illness. These infected rabbits need to be treated by a rabbit friendly vet who will report the infection to the vaccine manufacturers. Vaccinated rabbits with Myxomatosis usually survive, whereas unvaccinated rabbits nearly always die. If you buy your hay and straw direct from the producer, try to use farms where the farmer hasn’t seen any rabbit with Myxomatosis on the land. Treat your cats and dogs for fleas, otherwise they may bring rabbit fleas home. Talk to your vet about flea control: some products are toxic to rabbits, and some rabbit products are toxic to cats. Make sure there’s nothing to attract vermin and wild birds to hutches/runs and use small-hole mesh on hutches/runs to keep unwelcome creatures out!